Carolingian, Conrad the Pacific. AD 937 to 993. The Middle Kingdom. The Middle Kingdom was Lotharingia, Italy and Burgundy. 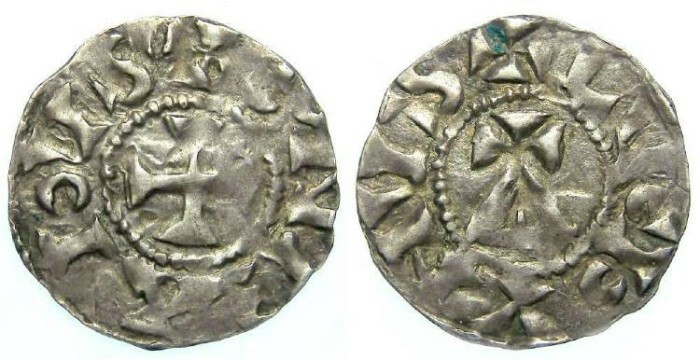 This coin was issued by Conrad III (the Pacific), as King of Burgundy. Size: 20.4 x 21.0 mm. Weigh: 1.13 grams. Obverse: Cross with CONRADVS around. Reverse: Cross on a trianglular platform (temple pediment) with LVGDVNVS around (the inscription is crudely engraved, as is usual for the type). Carolingian, Eudes denier, as King of the West Franks, AD 888 to 897. Carolingian, Eudes, AD 888 to 897. King of the west Franks. Carolingian, King of Aquitaine, Pepin II, AD 839 to 852. Carolingian, Lothaire, AD 954 to 986. King of the Franks.